The stunning Rasaleela Sophie Dress is a classically elegant, comfortable and versatile design. 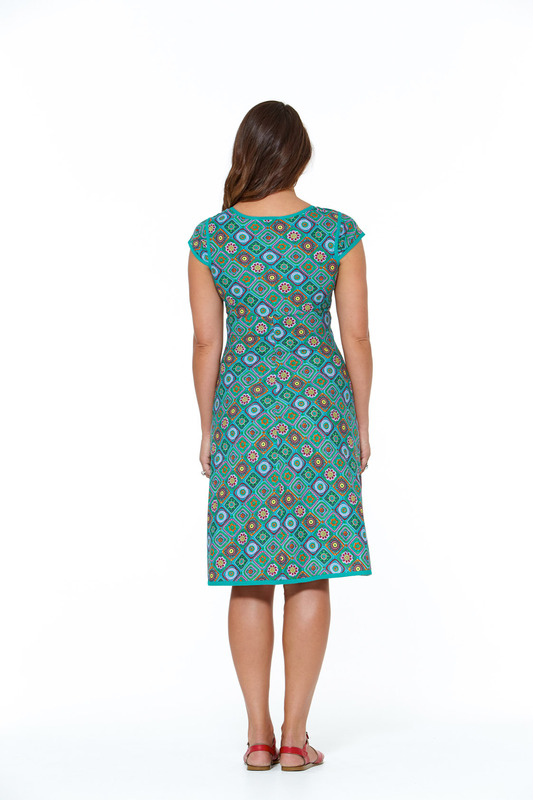 This flattering empire line dress features a fitted bodice,cap sleeves and an almost square shaped scoop feature neckline, with the bodice area detailed in pretty trim ( Teal ) to sleeves, bodice and hem. Sophie fits like a glove and is cut on the bias with an A-line shape, giving the 100% crisp cotton fabric a slight stretch, skimming the tummy to give a super flattering look. Our fabulous patchwork inspired print is a standout one consisting of blues,orange,pink,green and yellow patchwork looking patterns. The Sophie is a perfect trans-seasonal dress for spring, summer or autumn, great on hot days, and perfect on those cooler evenings teamed with a cardy and flats or your favourite cowboy boots!